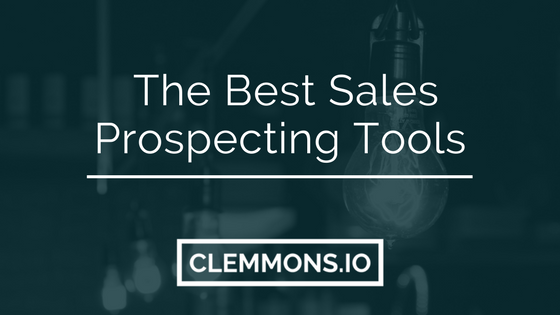 I’ve previously outlined how tools for sales prospecting work at the top of the sales stack, and now I’ll go into detail for the sales prospecting tools portion. These sales tools are essential for outbound lead generation. Sales intelligence and lead prospecting should be a top priority for B2B and enterprise sales development teams. As far as tools & software for lead generation, the most common format is in web apps, or SaaS, along with Chrome extensions. The biggest challenges to starting outbound campaigns involve creating the Ideal Customer Profile (ICP), and having accurate data. Determining the qualifying criteria for accounts and titles within companies. Ensuring a quality database of email addresses and phone numbers. Finding anyone’s email on the internet was once a dream of the past, but is now possible through multiple methods, all thanks to innovative sales prospecting software. 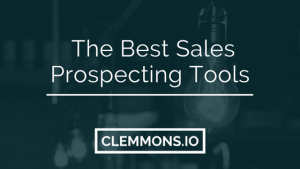 Note: Some of the below products are part of a suite of products; I’ll list those that include sales prospecting tools below, otherwise you can find others in the list of the best cold email tools here. Anyleads is a suite of B2B lead generation products for prospecting, creating content, and connecting with B2B influencers. For the sales prospecting component, users can upload a list of domains and then receive a CSV (Excel) file with contact data. This is otherwise known as domain enrichment. You can also input other data points (first name, last name, company name) in order to get emails. Anyleads also includes outbound email automation capabilities. Hubsell is a sales automation platform that combines human-powered prospecting with data-powered lead scoring and enrichment in order to provide users with highly targeted prospect data. There’s also an outbound lead generation component to the product that includes multi-channel campaigns via email and LinkedIn messages, making Hubsell a dual-layer solution. It integrates with major CRMs like SalesForce & HubSpot, as well as Google Apps and Microsoft Exchange email accounts. Hubsell was founded by Karan Sharma in Berlin, Germany. 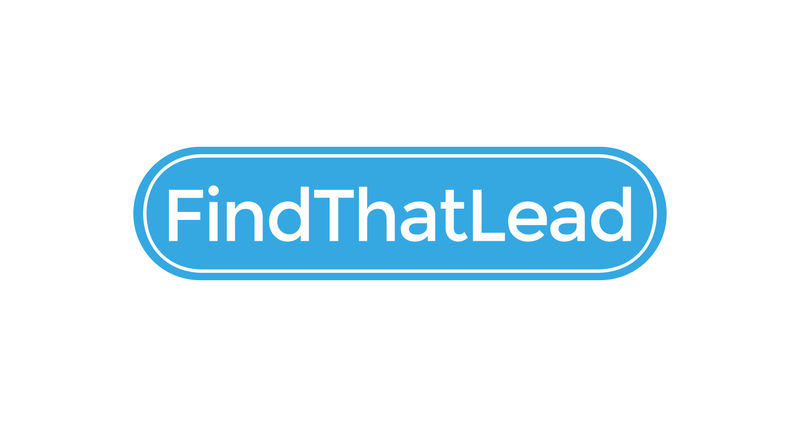 FindThatLead fills in the void left after Hunter’s LinkedIn integration was discontinued. It provides corporate emails along with verification. 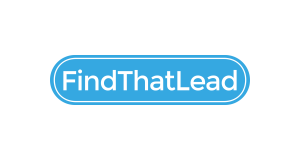 FindThatLead has a chrome extension and a Google Sheets integration. Founded by Gerard Compte in Spain, FTL helps open the market up to other growth hacking and outbound marketing enthusiasts. UpLead is a B2B contact database for lead generation.  Founded by Will Cannon in Los Angeles, California, they are committed to helping sales teams build lists that have high data quality. Hexa.ai (formerly ProLeads.io) is a sales prospecting platform that aids in personalization and efficiency. Hexa provides data-driven prospecting by automating lead enrichment. It directly integrates with a plethora of data providers (Clearbit), emails tools, and CRM’s (Salesforce). Update: This personalisation technology has been acquired by OutBoundWorks. Prospect.io is a another dual-layer solution, which combines a Google Chrome extension, which can harvest prospect information from LinkedIn profiles, and a cold email outreach platform into one. It’s a useful lead generation software if you utilize LinkedIn as a foundation of your research and sales intelligence activities. LeadCandy provides highly targeted sales leads by analyzing the customers of competitors & complementary products and by leveraging the network of teams to find referral paths to potential leads. LeadIQ allows users to prospect smarter. They provide verified work and personal emails, cell phone numbers, and other account data. Reveal, which turns anonymous web traffic into company profiles based on their IP Address. Clearbit has a self-serve model for anyone to use, in addition to a direct integration with Salesforce, along with Zapier connectivity. 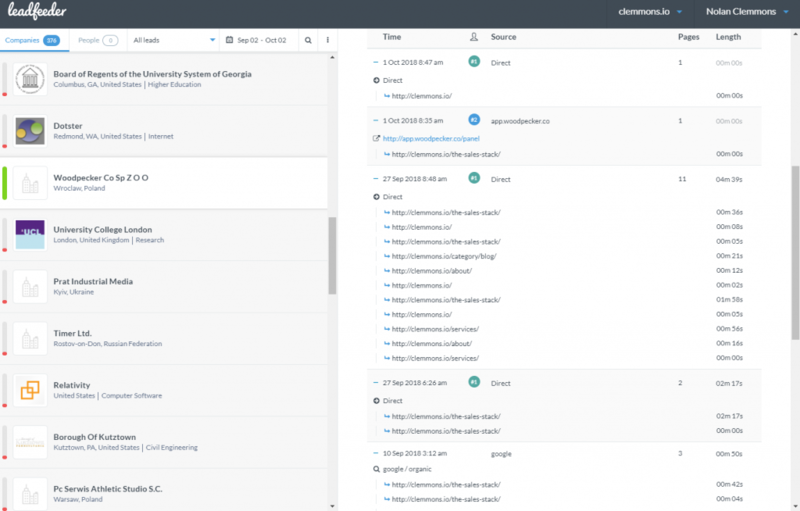 A free version, Clearbit Connect, is a plugin for Gmail and G suite email that grants a certain amount of search credits (usually 100 or so) per month. Leadberry can help identify web traffic using your Google Analytics Data. Leadworx can help identify anonymous website visitors, as well as help you configure automation rules & workflows, so that new leads can be acted on with their real-time API. 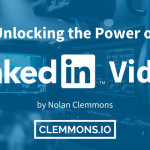 This allows for the creation of custom audiences for Facebook and LinkedIn ads. What’s more is that Albacross integrates with Zapier, which means a wide range of applications are at your disposal, such as different CRM systems, email marketing tools, etc. Thus, you can effortlessly export your targeted leads to your CRM system, email outreach tool, etc. Apart from this, Albacross comes with an account-based marketing solution, where you can buy and display advertisements targeted only to the peculiar companies you’re interested in. With Albacross you’ll be able to boost your B2B sales by turning your website visitors into leads and eventually into paying customers. Leadfeeder is a sales intelligence tool that identifies the company of unknown website visitors. By integrating with Google Analytics, Leadfeeder can tell you what companies are browsing your website, and what their behaviour looks like. This represents a fusion of inbound and outbound marketing working in tandem. After qualifying visitors (based on which pages they viewed and/or for how long), you can then search for the right individuals in that account and send them to your CRM or marketing campaign via Zapier and various direct integrations. As you can see, LeadFeeder was able to help me predict an email from the Woodpecker staff (which arrived the next week). Two unique team members viewed my blog, with their respective browsing activity shown. Oxyleads is an outbound sales development software suite that includes both prospecting and messaging components. It’s quite common to see such technology including two or more layers in the sales stack under one roof. 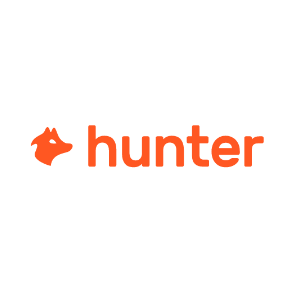 Hunter is a lower cost alternative to other enterprise sales prospecting tools. It previously had a Chrome extension for turning LinkedIn profiles into emails, but that feature has since been discontinued. The extension still works for domains, and it integrates with Google Sheets. Another Chrome extension for sales prospecting is improver. It’s an email finding tool to aid in B2B lead generation. Designed to be used with LinkedIn and other social media platforms, it makes lead list building much easier by showing contact information when visiting social media profiles. Stirista Scout is a B2B Sales Prospecting Tool that aids in prospect segmentation and enrichment. It was created as an internal tool originally, since the company specializes in data enhancement for digital marketers. Snov.io also has an email sending interface built-in to its product suite. Most interesting is its technology checker, where you can search for companies using various technologies, such as CMS, Analytics, eCommerce, and other categories. AeroLeads can provide you with phone numbers of prospects, which isn’t something as common as one might expect. I recommend that you hire a virtual assistant (VA) to aid you in processes involving B2B prospecting, in addition to using automation tools. There are some aspects to campaigns, such as data polishing, that require human quality assurance checks. At times, even the best technology can produce errors, or perhaps the data source was faulty to begin with. In any case, you don’t want to erode goodwill by messing up the “FIRST NAME” field in a cold email. You can find more tips for sales prospecting on Tenfold’s blog. Twitter (FollowerWonk), LinkedIn, and even Facebook can be goldmines for prospectors. You can identify potential targets based on what company they work for, who they follow, and what groups they are a part of. Getting this type of data at scale is much easier than one might think. Twitter and LinkedIn profiles are public for the most part, and once you are a member of a facebook group, you then have access to the list and can engage accordingly. Depending on your industry and/or niche, there are usually some directories that will list out businesses. Sometimes theses could be trade show exhibitors, speakers, or other industry associations. These lists can be extracted easily enough in most cases. AngelList, BetaList, and Crunchbase are good for finding startups and venture-backed companies. Capterra & G2Crowd include various software companies for you to browse. Clutch has digital agencies and outsourcing companies. There are plenty of databases that provide company data and contact information. One of the market leaders, DiscoverOrg recently acquired Zoominfo (which also owns Datanyze) in early 2019. Once you have a domain name for a company, most tools can take things from there and fill-in the info that you’ll need within a spreadsheet. You can then proceed to enable your lead generation engine by using Zapier to integrate with your respective tools, depending on how your funnel is configured. Whether you fundamentally need help creating the right targeting profile, or merely need someone’s email address or contact info, sales prospecting tools are essential for enterprise sales teams. The next part of the sales technology stack would be the messaging. Before you start running outbound campaigns, however, you’ll need to add your prospect data to your B2B Sales CRM Software. How you structure cold prospects, warm leads, and active customers will always vary, but if you plan ahead, it will make the sales cycle move along much smoother. Disclosure: In some cases, I may have a relationship with the company listed, or receive some sort of benefit by listing them in here. 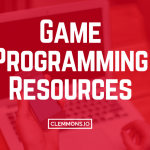 Often enough, that’s in the form of a free account; although most of them have trial or demo versions available for anyone to test out. I think you could also include a lead generation automation service – Leadworx. Leadworx automates inbound lead generation for B2B companies. 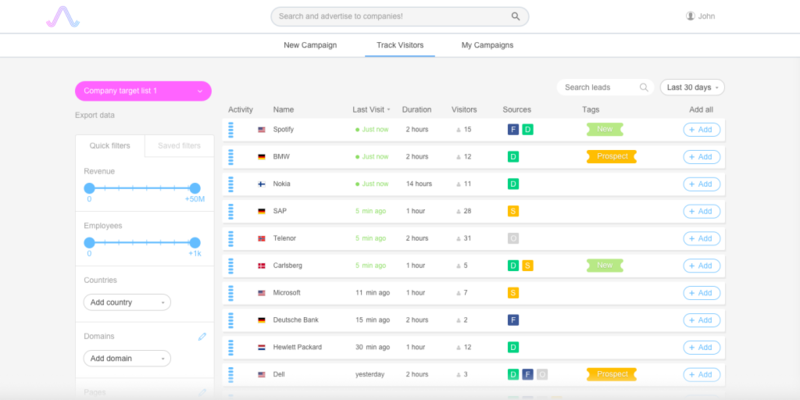 It tracks the website visitors and finds out which company the visitor is from and how much time they spent and some insights on the company. Once you know who’s visiting your website, you get contact information of decision makers working with those companies. This process is automated and has been doing a decent job for companies like NapoleanCat, Curious Jane, Brainly, and thousands more. Thanks for the note. I will check out Leadworx. You are quite right, Shubham. A steady flow of prospects and leads are essential for any B2B sales pipeline. I’ll check out AeroLeads. Scout is another great prospecting tool! Give it a try! Well done! Very helpful tips. I have used a few lead generation tools in the past for my small business which allow me to get email addresses from twitter accounts or any website. That’s the greatest way that was ever invented for finding prospects for your business and then nurturing them into your clients, employees or promoters of your service. This is the main approach in building a sales cycle. Through trial and error I’ve settled my decision on Snovio and Hunter. Hi Nolan, thanks for including Oxyleads! We’re honored to be on the list. Love the article! Definitely agree that prospecting and intelligence should be a top priority for B2B and enterprise teams. I think a 4th big challenge when starting outbound campaigns is maximising your contact database by crafting well-written cold emails that your prospects will reply to at scale. That’s the challenge we’re trying to solve at actionable.me. We’re an automated cold email outreach platform with a focus on making personalisation really fast (since personalisation increases response rates) and building tools that make responding to cold emails simple for your prospects. Nice article with Nolan. When compare to others Snov.io is best. Hi Nolan, thank you for the mention. Very much appreciated.